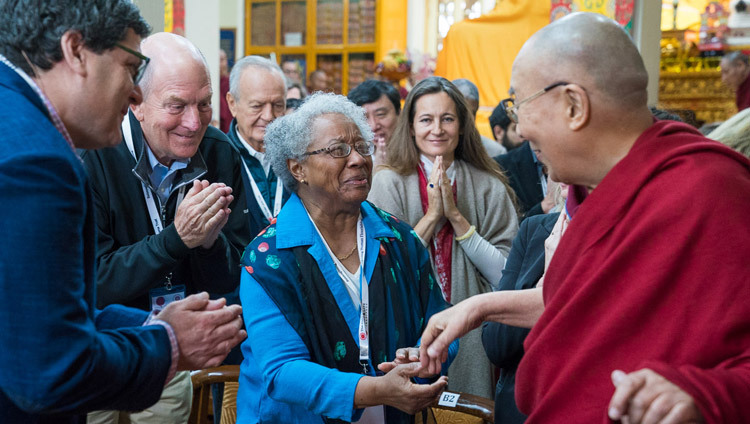 Goleman informed him that Robert Roeser, Matthieu Ricard and Sona Dimidjian would talk about some of the research that is going on in relation to ethics and compassion in education. However, first of all, Goleman acknowledged His Holiness’s advocacy of secular ethics and asked what it means and why it is so important for the 21st century. 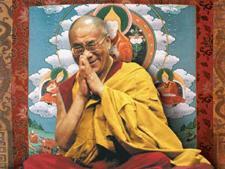 “The world is facing an array of problems,” His Holiness replied, “many of which we have created. People who make trouble were not necessarily trouble-makers when they were children. In fact, scientists say they have observed that basic human nature is compassionate. But if that’s so, why do we end up creating so many problems for ourselves? “One reason is that we don’t have a holistic view, we only see things from a narrow perspective. If we were to take a broader view, the problems we confront wouldn’t seem so significant. Then we would be less irritated and angry. We also need to understand that if we act in this or that way, there will be consequences. Narrow minded people don’t seem to give any thought to the consequences of their behaviour. And we need to appreciate that we are all interdependent. “Buddhism tells us that destructive emotions are rooted in ignorance. They are not supported by reason. Positive emotions on the other hand are based on reason. What’s more, negative emotions cannot co-exist with a wisdom that understands reality as it is. I’m a Buddhist, but I never say that Buddhism is best; I can even be critical of it. Great masters of the past like the Buddha, Mohammad and Jesus Christ, when they taught from their own experience, didn’t do so intending to prompt quarrels and disputes in the future. No matter how attractive Buddhism may seem, it will never appeal to all 7 billion human beings alive today. “Shantideva wrote that whatever suffering there is in the world is due to self-centredness. We are social creatures and our very survival depends on others. When we observe the effects of climate change we see how urgent it is that we work together if we are to live happily. Humanity is under threat. What time we have left would be better spent if we lived in harmony. “When we notice differences between us, we should treat them with respect instead of asserting that we are right. I have often said that this century should be an era of dialogue. We have to live together. We are all human beings. We need to focus less on the differences between us and engage in dialogue with each other. “What we’re trying to do here is to educate people, to show them that the real way we’re going to become happy individuals, living in happy families and communities is to become more warm-hearted towards each other. We need more loving kindness. We can see even among animals that this is effective, that the calm dog has more companions and the barking aggressive one is by himself. “Thinking of ourselves as somehow special isolates us. I don’t dwell on being the Dalai Lama, I think of myself as just another human being. And when I meet someone else I greet them as a brother or sister, which brings me joy. Shantideva is right to point out that self-centredness, being obsessed with ourselves, just brings us trouble. “If we take a sense of universal altruism seriously, where is there room to have enemies? Our real enemies and the enemies of humanity are negative emotions like anger and hatred. Indeed, people who are dominated by powerful negative emotions should be objects of our compassion. His Holiness turned to Dan Goleman and asked if he had spoken for too long. He laughed as he told him that while he may be tired, once he opens his mouth he finds it difficult to stop talking. Reviewing his research as a developmental, educational psychologist, Robert Roeser has asked whether qualities like kindness emerge naturally or have to be developed, and whether they change in the course of our lives. He asks what the biological factors are that may change our experience of them. He talked about different categories of ethics—an ethic of justice, an ethic of care and an ethic of restraint. Roeser has concluded that from an early age we have moral sensibilities, citing evidence that new born babies are affected when they hear another baby cry nearby, but it can take time for them to be activated. Unfortunately some people do not develop a coherent moral code or way of being in the world, which is why making secular ethics available is so important. Human beings are born with a seed of compassion, but we have to learn to extend that sense of compassion to others. Seeing others in terms of ‘us’ and ‘them’ can be changed if we see them instead as ‘just like me’. Having loving relations, positive role models, collaboration, engaging with others who are different, and understanding our common humanity are among powerful educational tools for change. A short video clip of children talking appreciatively about kindness and other qualities prompted His Holiness to observe that we all know that children want friends. The main factor in making friends is showing affection. Anger turns them away. “Like other creatures, human beings look after their children until they can look after themselves. It’s at that point when they no longer need to be cared for that we must educate them, because they are still members of the community, part of humanity. In his presentation, which includes beautiful photographs he has taken over many years in the Himalayas, Matthieu Ricard discussed the role of compassion in secular ethics. He talked about the importance of fairness, how being treated unfairly can lead to anger. He mentioned that ethics requires us to think of the short and long term effects of what we do and that compassion is about wishing primarily for other people’s well-being. It involves an aspiration to avoid suffering and achieve happiness, but must also involve the wisdom of understanding the causes of suffering. He suggested we could summarize ethics as growing from the thought that just as I don’t want to suffer, nor does anyone else. It’s not just a set of rules but involves a broader view of the world. He defined altruism as the wish that others may find happiness and the causes of happiness, while compassion concerns the wish that others be free from suffering and the causes of suffering. He talked about their affective aspects, being aware of the suffering of others and having the courage to do something about it. There are also cognitive aspects involving an analysis of the causes of suffering, particularly ignorance, which is a distortion of reality. To these qualities he added empathy, which he defined as affective resonance with others. After a break for tea, Sona Dimidjian discussed effects of a brief training in compassion that has been designed to be available as a mobile phone app. Participants engage with it for several minutes every day and are shown the advantages of compassion and the drawbacks when it is missing. Trainees and a control group were then invited to listen to stories of people in distress and their responses monitored, specifically in terms of contributing financially to charitable projects to help them. Those who had undertaken the compassion training were steadier in their wish to provide such support, whereas members of the control group seemed unable to maintain any interest. After citing His Holiness’s remark “Love and compassion are necessities, not luxuries. Without them, humanity cannot survive,” Dimidjian asserted that just as achieving well-being is an urgent public health need, so too is eradicating selfishness. The storm that had raged much of the morning, bringing dark skies, wind and rain, continued as His Holiness walked down from the temple to the car that would carry him home. He still took time to greet well-wishers who had gathered at the bottom of the steps to see him. He will return for the conference’s final session tomorrow morning.